By writing with a distinct STRATEGY in mind, you can create high-impact resumes that help set your clients far above their competitors. In this rigorous 4–week fully interactive training program, you will learn how to approach each of your clients resumes in a manner unique to their goal employment position. Using your Certified Resume Strategist eGuide, teamwork with your colleagues, and personal eMentoring by your program facilitator you will explore topics like developing your client’s value proposition, designing a powerful qualifications summary, creating a high-impact career history, and much more. 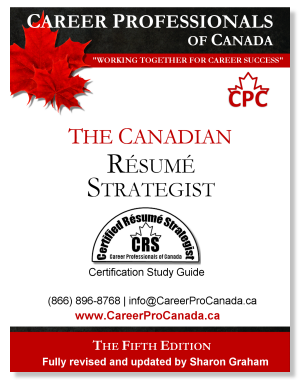 The cost is $795 (CAD) for members of the Career Professionals of Canada and $950 (CAD) for non-members.